As River Song would say, "SPOILERS". I've watched 'The Day of the Doctor' twice now, and although I found it less frustrating the second time, I still see it as an 'enjoyable disappointment'. Unfortunately, I've also thought this about a lot of recent Doctor Who episodes. Everybody on the internet seems to be raving about 'The Day of the Doctor' - it holds an average rating of 9.5/10 on IMDB - but I can't give it more than 6.5 out of 10. I want to know why people like it so much, and if my criticisms are misplaced. There were lots of good things in this special episode: it was nostalgic without being too focused on the past (the opening titles were great), the acting was strong, Billie Piper returning in 'Bad Wolf' form as 'the conscience of the Moment weapon' was a clever idea, the Tom Baker cameo was intriguing, and it was great to see Paul McGann regenerate into John Hurt in the mini-episode. Seeing a shot of Capaldi's eyes was also exciting - I can imagine cinema goers loved this bit - but it encapsulates one of the major problems with recent Doctor Who for me: Moffat and the writers don't take the show seriously enough. Why was 13 there? It made no sense. Obviously the fans will enjoy seeing the shot of Capaldi's eyes, but it made no sense 'in universe', and it cheapens the show in my opinion. I suppose you could argue that the future Doctors would know about the event and would be there, but in that case where were 14, 15, etc? Are we to assume that Capaldi's Doctor is actually going to be the last one? Of course not, so why show him? As for the episode itself, it should have been very serious: it concerned an enormous galactic war, the Doctor's darkest moment and genocide ('auto-genocide'?). We should have seen the horrors of the Time War - all of the terrible things mentioned in 'The End Of Time' like the 'Skaro Abominations' and 'The Nightmare Child' - and what the Time Lords had done to justify their destruction along with the Daleks. We could have seen an epic battle, and it was a great chance to portray something a bit different to the typical 'blockbuster space war' seen in films. For example, where were the 'time weapons' that were being used to reverse the outcome of battles - forcing the combatants to endure countless deaths - but were also inadvertently tearing reality apart? Instead of this, we were treated to a few shots of Gallifreyan foot soldiers firing lasers, and far too many lighthearted moments. I understand that this is the fiftieth anniversary, and a celebration of Doctor Who, but this needed to be a dark episode, and I don't think they captured that. The War Doctor concept was also criminally underdeveloped, especially given the build-up following John Hurt's introduction at Trenzalore. He was meant to be a battle hardened fighter shunned by the 'real' Doctors, but he didn't seem that tough or dark, or shunned; the War Doctor just bantered with 10 and 11* in this episode! I think the War Doctor character was only created because Christopher Ecclestone didn't want to be involved, and then they didn't develop the idea fully enough or show enough of him actually fighting in the Time War. I liked the idea of the Ninth Doctor being the one who actually was battle scarred and hardened, and Rose gradually 'fixing' him. It's a real shame Ecclestone wouldn't return for this anniversary episode. On a general note, the last few series of Doctor Who have seemed lazy in wrapping up plots, with too many Dei ex Machina and too much silliness. This leads to endings like in 'The Day of the Doctor' where there was no real (or coherent) explanation of how they made Gallifrey disappear. Even if they had explained it, it would have just been 'timey wimey' or sonic screwdriver nonsense. The show doesn't need to explain everything, but it leaves far too many questions unanswered, and I suspect it is because the writers don't have an answer rather than a deliberate choice. For example, how did the 'Bad Wolf weapon conscience' break the timelock? If you introduce a 'timelock' concept into a show about time travel (and rewriting history), you shouldn't be able to overcome it so easily when it suits the story. Also, given that the Time War started during the 8th Doctor's incarnation, how can the 1st-7th Doctors be working on the calculations to freeze Gallifrey in time? They wouldn't know anything about it (unless there's a Bad Wolf or 'Clara in the timestream' explanation?). The entire solution is just rushed and explained away at the end of the episode. Doctor Who has got the potential to be an amazing show, but it so often - especially recently - is a massive disappointment. Episodes like 'Father's Day', 'Turn Left', Midnight', 'Blink' and 'Doomsday' are some of the best things I've ever seen on television, and there have also been some good episodes with the Eleventh Doctor such as 'The Eleventh Hour', 'Amy's Choice' and 'The Girl who Waited', but I can't help but feel the last few series have been too lighthearted. I blame Moffat: he wrote great standalone episodes whilst RTD was in charge - such as 'Blink' - that were dark and menacing, so why the change now? He can't write - or finish - a good story arc, and putting him in charge of the entire show has ruined it, in my opinion. Whilst I like Matt Smith, I also think he must shoulder some of the blame for being too 'wacky' at times. It also seems to be aimed more at children than adults now and, whilst it's still enjoyable, it makes for flawed television that is frustrating to watch. In my opinion, it should be a family show, not a children's show. There never seems to be any genuine sadness or fear or peril anymore; everything's a bit silly, and then they just solve everything with love (and everybody lives). Hopefully, Capaldi will make for a darker doctor, but it would be great to have an adult Doctor Who that takes itself more seriously (yes, I know the canon is a flexible entity in Doctor Who, but the writers just don't seem to respect the show enough at the moment). Capaldi would be great at this, or they could bring McGann back, or John Hurt could even do a Time War series. Or maybe I'm looking for something more like 'Torchwood'? I'd be interested to hear your thoughts on last night's Doctor Who, and on the direction the show has taken in general. 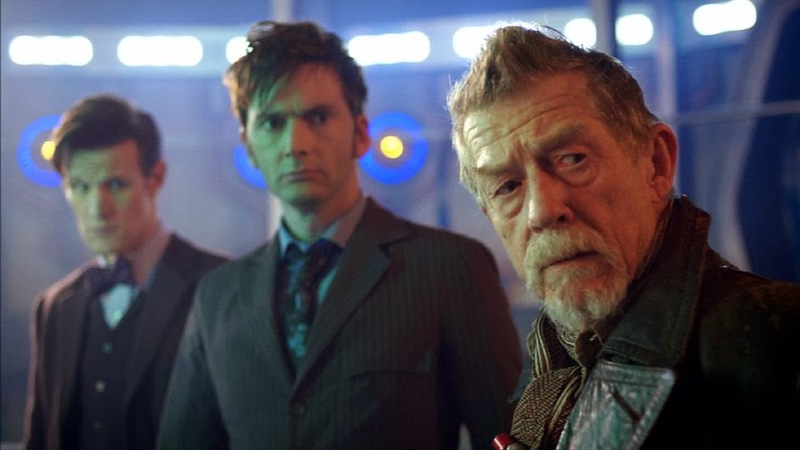 Should the War Doctor have pushed the button? Should Moffat have changed the outcome of the Time War like this? Should the show be more serious? * Or should that be 11 and 12? ** As an aside, one interesting idea I've read about the Bad Wolf part is that, in the original timeline, the Doctor did destroy Gallifrey. Then the events of 'The Parting of the Ways' happened and Bad Wolf was created. As we know, the Bad Wolf has the power to meddle in time. The idea is that the Bad Wolf, upon gaining knowledge of the Time War, echoed back and affected the Moment, writing itself in as the interface (why else would the interface choose someone from the Doctor's Future?) Additionally, the fact that the interface got mixed up on the past/future thing was very Idris (i.e. the Tardis), so Bad Wolf changed the way the interface reacted to the Doctor: it was much more sympathetic to him and let him interact with the future, thereby changing what happened. *** Another interesting aside - a great idea I just read: how good would it have been if the BBC had kept the next Doctor (or even the fact that Matt Smith is going to regenerate soon) secret until Saturday, and then the big reveal would have been "No, Sir - 13!" and you saw Capaldi's eyes!